The Department of Human Services owes payment to service providers throughout the state. Some people must now travel several counties away from their homes to access services due to agency closures. On Twitter last week, someone called my website, the Illinois Atlas of Austerity, “beautiful and devastating.” Someone else said it was “depressing as heck.” I can’t think of higher praise. With maps and infographics, the website visually chronicles the impacts the state budget impasse has had on social services, higher education, youth programs and public health. 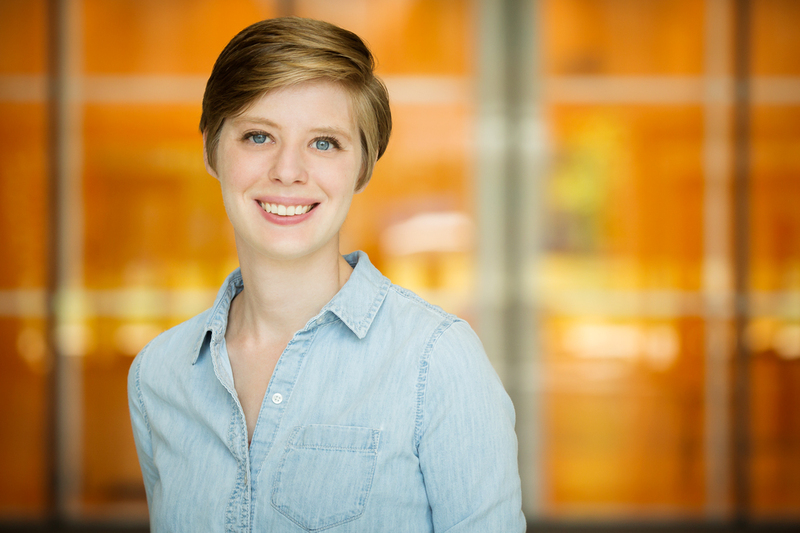 Melissa Heil, a graduate student studying geography, collected data from numerous agency reports to build the Illinois Atlas of Austerity website. In February of this year, I heard that Lutheran Social Services of Illinois, the largest statewide social service provider in Illinois, had laid off 43 percent of its staff and closed or reduced services throughout the state as a result of the state budget impasse – a devastating loss for the 4,700 Illinois residents whose services were cut. I wondered how other state-funded organizations were faring. I found that advocacy organizations throughout Illinois, such as Voices for Illinois Children, had been tracking the consequences of the stalled budget. I realized that many Illinois residents would care deeply about these consequences, but would not have the time to seek out numerous reports. 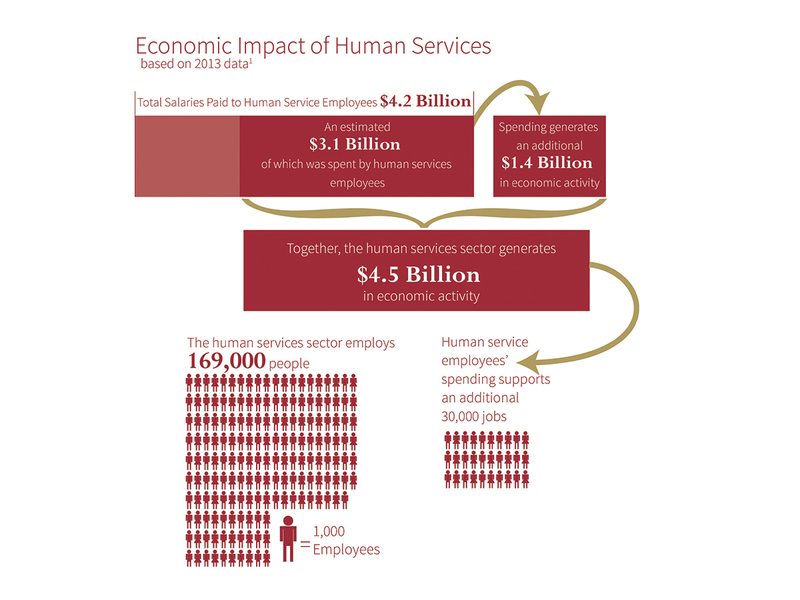 The human services sector generates $4.5 billion in economic activity in the state of Illinois, in addition to the services provided. 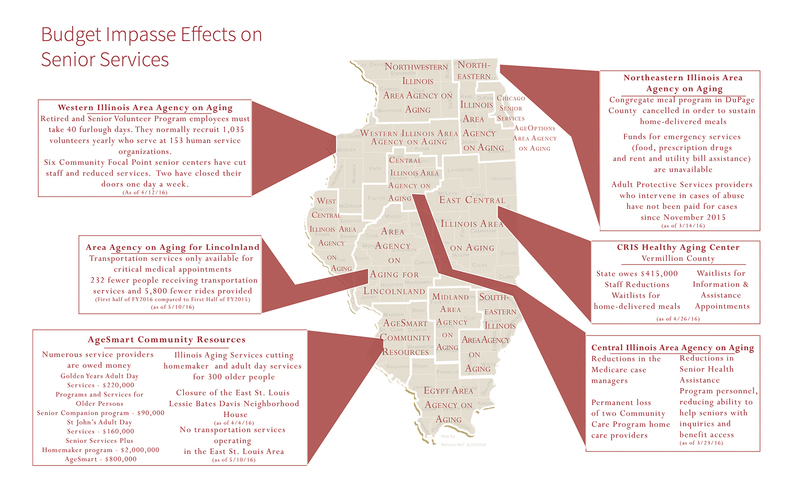 I decided to use maps to tell the story of the budget impasse and its consequences for Illinois residents. Well-designed maps can help people engage with and understand difficult topics. Not only can maps make spatial patterns in data visible at a glance, but we can see ourselves in maps. We can find home on a map and see how we relate to others. On my site, maps paint a picture of the numerous impacts the budget stalemate has created throughout the state of Illinois. In the Chicago area, the number of people affected is staggering. In parts of downstate Illinois, the loss of funding for human services has an even larger impact on a per capita basis. According to the Illinois Public Health Association, 80 percent of responding health departments in the state have been affected by the budget impasse. 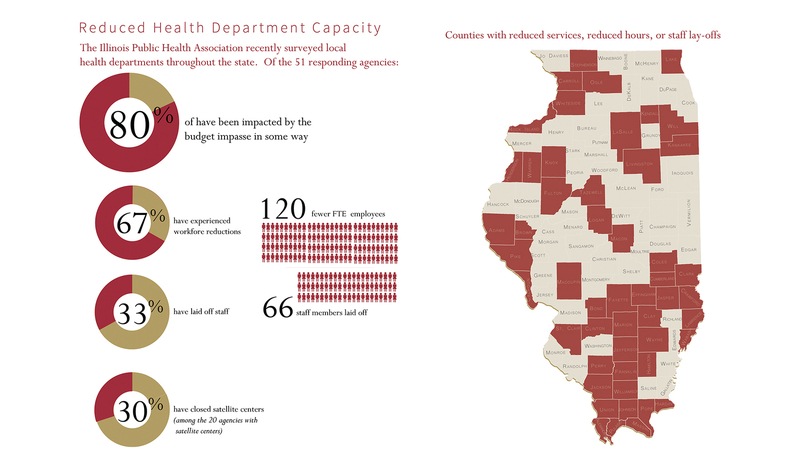 Roughly 50 percent of public health departments are operating at reduced capacity. These organizations provide immunizations, conduct health screenings such as breast cancer screening and HIV testing, and investigate disease outbreaks. The Autism Program can no longer provide education and services for children with autism from low-income families. In Springfield, the cost of a two-hour social skills group rose from $25 to $180 a session. The Redeploy Illinois program, which reduces juvenile incarceration through community-based programs for at-risk youth, is now suspended in 24 counties. It costs $5,502 annually for a youth to participate in the program. One year in juvenile detention costs $111,000. More than 125,000 MAP Grant recipients face uncertainty over tuition support. This affects 50 percent of black and Latino students at public universities. Fifty-seven percent of MAP grant recipients are first-generation students. An estimated 8,187 clients of homeless service providers have seen their services reduced or eliminated. Explore the maps here, and on my site, to learn more about the dire statewide consequences of inaction in Springfield. Regional services for senior citizens have been cut throughout the state.